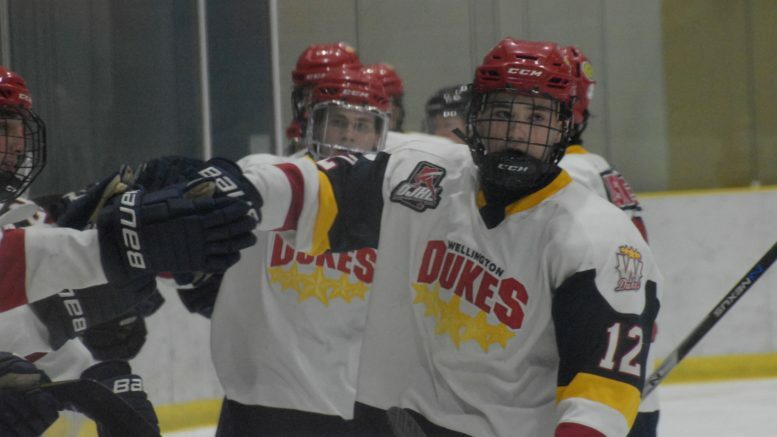 After dominating the Trenton Golden Hawks for virtually the entire seasonal slate of head-to-head games leading in to Sunday’s final showdown in the Battle of Quinte, the Wellington Dukes finally blinked. A day after beating up on the Kingston Voyageurs 4-1 on the OJHL Game of the Week broadcast nationally on television station CHCH, the Dukes found themselves in a dog fight on Sunday. Tied 1-1 into the second overtime which saw three players aside, a Wellington foray to the Trenton net generated a reciprocal rush the other way. 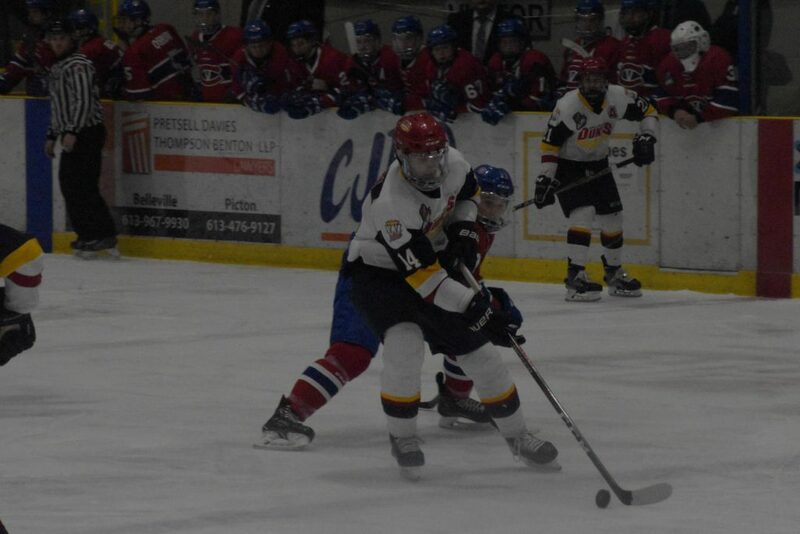 Noticing he had a forward to beat, Trenton’s Michael Mannara completed a nice toe drag move to get past a Wellington checker and then made a deke all alone on Dukes starter Logan Bateman to finish off the 2-1 win in favour of the visitors. Considering Wellington (27-18-4) out shot Trenton 47-30 and outplayed the opposition for most of the contest and the season series if the gaze of the observer goes back to early September, it would be easy to excuse a double overtime loss at this stage of the season to the Golden Hawks. After all, it’s Wellington’s dominance (Four wins and two regulation ties) over Trenton that’s kept their Loyalist Parkway rival out of first place in the East Division. After a scoreless first, Wellington got on the board with just over five minutes to go in the second off a won face off in the Trenton zone. After some nice puck movement allowed Tyson Gilmour to feed it to Dylan Massie alone in front, it would be Elijah Gonsalves swooping in and banging home a loose puck at the 5:06 mark of the second to push Wellington ahead 1-0. Trenton’s answer came in just 3:30 into the third as Jeff Lindsay’s seeing eye shot found a hole underneath Bateman to even the score at 1-1. Wellington would out shoot Trenton 12-7 in the third and 3-2 combined in the overtimes but it was Mannara’s effort that sealed the deal for the visitors. A day prior it was Wellington systematically disarming the Kingston Voyageurs 4-1 as the hosts out shot the Vees 47-20. After an early Ryan Gibson goal got Kingston on the board at the 3:30 mark, Wellington would start to exert their will. Outshooting the Vees 16-6 in the frame, Wellington’s Ben Woodhouse would score on the powerplay at 15:06 to tie the game at 1-1. Just 34 seconds into the second, Wellington would grab a lead they would never relinquish as Andrew Rinaldi would beat Kingston starter Alexi Masanko off a nice Frank Vitucci set up. Adam Usinger would bag his seventh of the campaign with under two minutes left to make it a 3-1 spread in favour of the Dukes. In the third, some dogged determination on the part of Eddy would set up Dan Panetta for the Belleville native’s eighth of the season at the 4:48 mark. Jacob Thousand picked up his second assist of the contest on the Panetta marker. Virtually all the Dukes had something a little extra to play for this weekend as club owner Ken Clement created ‘Parents Weekend’, flying parents in from as far away as British Columbia to watch their children play and allowing the hockey moms and dads to connect and spend time together. Druce said the weekend reunion time between children and parents was a welcome occurrence. “It was really special to have the parents around this weekend and I can’t say enough about the ownership of this hockey club. That’s not something we see a lot of at this level but it was a really classy gesture by Ken and I know everyone appreciated it dearly,” Druce said. Wellington is due to travel to Cobourg Wednesday evening provided the weather cooperates and host St. Mike’s on Friday and Cobourg on Sunday afternoon. Wellington will wind up their regular season on Monday afternoon in Whitby.